Jupyter (formerly known as IPython) notebooks are great – but have you ever accidentally deleted a cell that contained a really important function that you want to keep? Well, this post might help you get it back. This is essential for what follows…because as the function is still defined, the Python interpreter still knows internally what the code is, and it gives us a way to get this out! The code is actually very simple, inspect.getsourcelines(function) returns a tuple containing a list of lines of code for the function and the line of the source file that the code starts on (as we’re operating in a notebook this is always 1). We extract the 0th element of this tuple, then join the lines of code into one big string (the lines already have \n at the end of them, so we don’t have to deal with that. The only other bit is a bit of IPython magic to create a new cell below the current cell and set its contents….and that’s it! I hope this is helpful to someone – I’m definitely going to keep this function in my toolkit. Great tool, I will keep in my tool’s box. It is really important. 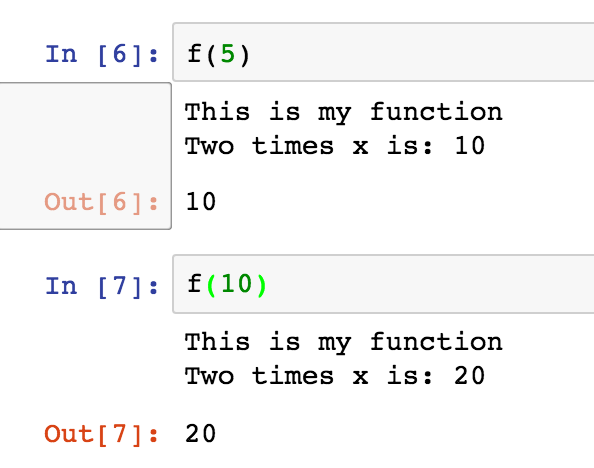 I am wondering why Jupyter creators (Perez and company) do not create an UNDO function inside EDIT menu? There is an undo function in the notebook, but it doesn’t cover everything. When you’ve deleted a cell there is an ‘undo delete cell’ item in the Edit menu, but you can also undo changes to the text in cells by pressing Ctrl-Z (or Cmd-Z). I think (though I am not 100% sure) that there is a per-cell undo buffer: so you can undo changes in separate cells independently. That does, of course, mean that you have to click on the cell that you want to undo things in before you can actually undo anything. You’ve just saved my life as well!!! Thank you- just saved me 2 days work! Thank you. Again! Thank you for saving me from myself.. Fantastic, this helped me a lot! This looks really good – however I need to rescue a deleted function in a Julia notebook. Can you point me towards how to translate that into Julia code? Unfortunately this uses Python’s introspection capabilities, so won’t work with Julia. I’m not familiar enough with Julia to know if there’s a way to do it in Julia – but you could try asking on a Julia forum somewhere whether there is a way to get the source code of a function once it has been written and executed, as that’s basically all I’m doing here. That’s a great post. Suppose you have accidentally deleted some parts of the codes in the same cell and forgot to undo before closing the notebook, is there a way to recover the codes later when the notebook is reopened? Thank you. Thank you .. thank you .. You really saved me!